It is believed the boy fell up to 20ft from the balcony in a freak accident. A 14-YEAR-old Irish boy has died after falling from a second-floor hotel balcony in Majorca. 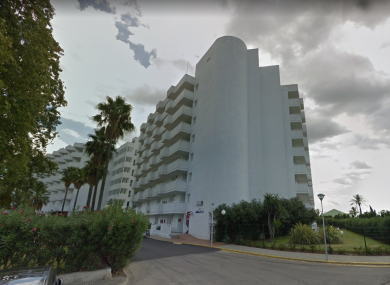 A spokesman for the Department of Foreign Affairs told TheJournal.ie that it was providing consular assistance to the teenager’s family after he fell 20ft at the four-star Eix Lagotel hotel in the resort of Playa de Muro. The teenager was admitted to an intensive care unit at Son Espases Hospital on the Spanish island shortly after midnight yesterday. It is believed he may have fallen in a freak accident after losing his balance while he was sitting on a chair on a balcony. The child’s mother managed to hold onto him as he fell, but he was fatally injured despite her efforts. Ambulance workers called to the scene are said to have diagnosed a punctured lung and a head injury, although the assessment of medics after the boy’s admission to hospital has not been revealed. A spokesperson for the Eix Lagotel declined to comment on the incident. Email “Irish teen dies after falling from hotel balcony in Majorca”. Feedback on “Irish teen dies after falling from hotel balcony in Majorca”.